The Israelis fully support U.S. intervention, despite the grave danger it poses to Israel. They think American action now will commit us to striking Iran later on—and they may be right. Last week, throngs of Israelis crowded a Jerusalem mall, shoving past one another to pick up government-subsidized gas masks. Their impatience was understandable. For days, American leaders had been openly contemplating a strike on Syrian defense capabilities, a move likely to provoke a swift retaliatory attack on Israeli soil. A chemical onslaught from the Assad regime seemed like a real possibility. The crowd was so unruly that the mall gave up on distributing the masks after a few hours. Any other state so concerned for its citizens' safety (and so vulnerably positioned, with Israel and Syria sharing nearly 50 miles of border) might try desperately to talk U.S. policymakers down from drastic action. Instead, Israel's housing minister, Uri Ariel, went on the radio to egg President Obama on. His message was unequivocal: "[Assad] is a murderous coward. Take him out." On the surface, an American strike would seem to expose Israel to immense peril, with no real benefits. Why would Israelis offer to undergo such an incredible act of self-sacrifice? It’s no sacrifice. All of the evidence indicates that it’s a careful bet. Netanyahu and company see the consequences of American actions in Syria as a small risk to undertake for what could prove a huge victory for Israel: bringing the U.S. one large leap closer to mounting a strike on Iran. Risking retaliation is scary. For Israelis, the alternative—having to face a nuclear Iran without guaranteed U.S. support—may be scarier. The Syria-Iran connection is not a hard one to see. Both are rogue states whose hostile weapons programs have threatened to destabilize the already-unhinged Middle East. The basic American reasons for striking Syria—to save innocent lives, to punish an oppressive leader for war crimes, to potentially oust a tyrannical regime—could certainly apply to a belligerent Iran as well. Israel is eager to help Americans make connections between the two nations. 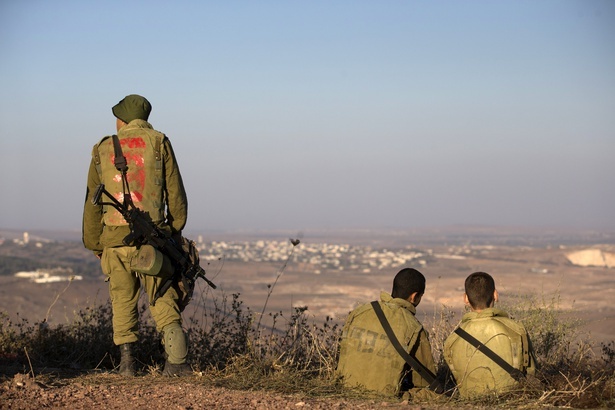 Several top Israeli officials have openly tied the Syrian predicament to the Iranian threat. Most recently, Israeli President Shimon Peres offered an Israeli radio station his confidence that, just as “Obama will not allow nuclear weapons in Iran,” he will make the right call and strike Syria. AIPAC, the American pro-Israel lobby, is following suit. “As we witness unthinkable horror in Syria, the urgency of stopping Iran’s nuclear ambitions is paramount,” surmised an editorial on the organization’s website, accompanied by a photo of Bashar al-Assad and Ayatollah Khamenei chatting casually. American policymakers are also starting to conflate the two. “Iran is hoping you look the other way,” Kerry warned the Foreign Relations Committee on Tuesday as they prepared to draft the resolution on a Syrian strike. Later in the day, everyone from Marco Rubio to Barbara Boxer to Chuck Hagel echoed his point. Since Israel is the state most concerned about Iran’s nuclear capabilities, that kind of rhetoric suggests we’re drifting toward Netanyahu’s best-case scenario—Congress justifying a strike on Syria based largely on the interests of Israel. Such a precedent could draw Israeli security as our new "red line," requiring us to go after anybody who crossed it. To renege at that point would destroy our credibility beyond repair. Whenever Israel decided it was time to fire at Iran, we would be compelled to oblige. President Obama seems to be speeding in that direction. Immediately after announcing that it would seek Congressional approval for the strike, the White House plainly presented the decision on Syria as a matter of Israeli security. Obama’s team knows that representatives on both sides of the aisle have professed their undying commitment to Israel's safety. While using that commitment to sell the Syria intervention is clever political strategy, it could set a hazardous example. Whether the U.S. should strike Syria is a tough choice, and whether to strike Iran may soon be another. But each needs decided on its own terms. Predicating the Syria decision on allegiance to Israel could establish a very dangerous precedent. Jake J. Smith is a writer based in Chicago.